Piero Lissoni has unveiled plans for a series of Miami penthouses to be built within his first architectural project in the United States. The collection includes five expansive Miami penthouse residences, which have been conceived in their entirely by the Italian architect and designer — even down to the furniture and appliances. The most expensive property is priced at $40 million USD, while the remaining units range between $11 and $20 million. 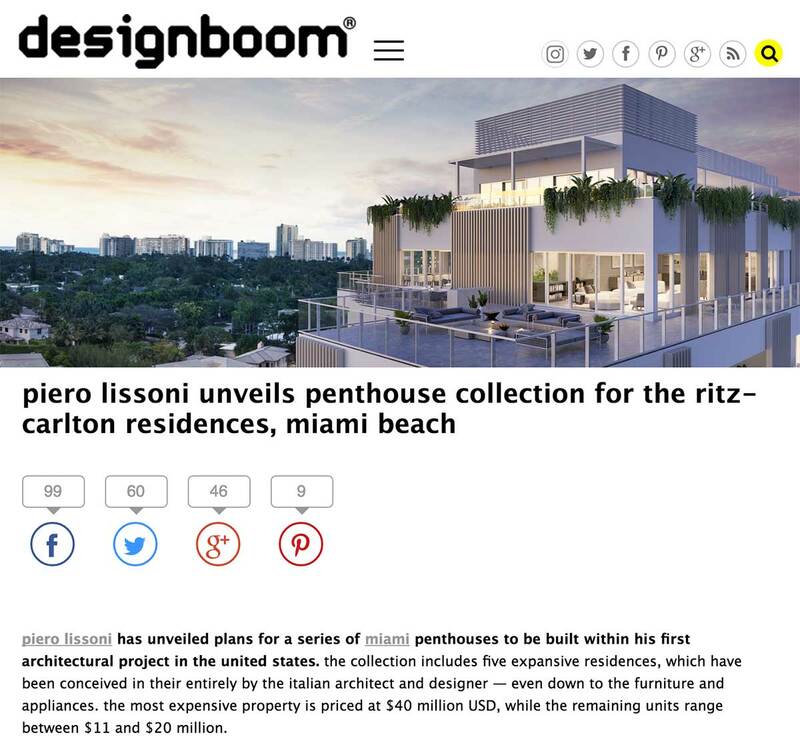 The Ritz-Carlton Residences, Miami Beach is a seven acre property that comprises 111 condominiums, as well as a limited collection of 15 standalone properties designed by Piero Lissoni. Surrounded by tropical landscaping, the development features a wealth of luxury amenities including gardens, entertainment spaces, cultural experiences, and even a private marina. The Piero Lissoni penthouse collection features expansive floorplans and layouts, with units ranging from 3, 4, 5 and 8 bedrooms and from 4,507 to 25,000 square feet. The $40 million dwelling combines two Miami penthouse residences to create an 8 bedroom property with 10 bathrooms and a private Hammam spa. Other facilities include two swimming pools with adjoining hot tubs, two private plunge pools, a wine room, and a screening room. The three remaining Miami penthouse residences all have ceiling heights ranging from 9’8” to 13’6” as well as expansive outdoor terraces. Stone flooring extends throughout all common areas, including the kitchen and bathrooms, while wood flooring is used in the bedrooms. Custom-designed Boffi kitchens include stone countertops and Gaggenau appliances.